Lamson Park. Who was Alfred Lamson? Click here for the Special Fan Tribute to Mr. Alfred Lamson. You will view Lamson park in a different manner and with special memories. Remember to scroll down for the Living Memorials written in his memory by friends and colleagues, especially one by Coach Yvette Girouard. 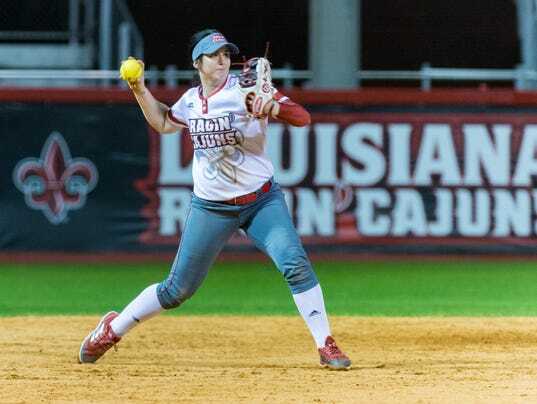 When former UL softball coach Michael Lotief was fired on Nov. 1, it was a huge jolt to everyone involved with the Ragin’ Cajun softball program. Imagine, though, how troubling the news was for Alissa Dalton. The sophomore had just transferred from two-time national champion Oklahoma, looking for a place to feel more comfortable. She arrived in Lafayette in late July, convinced she had found the program and the community that allowed her to feel at home again. Incredibly, just a few months into the process and suddenly there’s no head coach, controversy ensues and uncertainty reigns. “I was kind of frustrated at first,” said Dalton, whose No. 15-ranked Ragin’ Cajuns will open the Louisiana Classics Tournament against Southeastern at 4 p.m. Thursday at Lamson Park. Once the initial sting began to wear off, however, Dalton realized the reasons she chose to transfer to UL hadn’t actually gone anywhere. “I’m from Houston,” Dalton explained. “I love the Southern feel. I love the Southern hospitality. Even being at Oklahoma, which is a neighboring state to Texas, people treat you differently than they do in the South. Amazingly, another big recruit tool for the Cajuns in Dalton’s case was the trees. That’s right, the trees. And although several of her new teammates transferred out before the coaching controversy simmered down, Dalton still enjoyed her teammates. In fact, the strength of that team sisterhood only grew during the turbulent fall and actually further convinced Dalton she had made the right decision to move to Lafayette. “But at the same time, seeing how every girl here handles adversity and when a situation does happen instead of separating and looking outward, we all come in and get closer and deal with it,” she said. “I think it kind of made me fall in love with the program all over again. The next big moment for Dalton was learning that All-American shortstop DJ Sanders was one of the teammates who chose to leave. That meant Dalton wouldn’t be playing first or second base, but her favorite spot at shortstop. It also elevated Dalton’s status on the squad before she ever saw a pitch in a Ragin’ Cajuns uniform. Despite playing the same position, Dalton said she’s never tried to truly replace Sanders’ skill set at shortstop. “She’s a bomb power hitter,” said Dalton, who is leading UL at .455 with a homer and 10 RBIs so far this season. “She hits massive home runs. Of course, I would love to do that every at-bat like she does, but at the same time I do have the tools to bunt, slap, hit. New UL coach Gerry Glasco, though, has quickly learned Dalton is a special talent in her own right. The next step in Dalton’s comfort level returning was seeing the new coaching staff go to work in January. “I was really concerned that we had missed time in the fall, but the coaches have done an amazing job,” Dalton said. “Everything was at high speed. In the first few weeks, we pretty much fit an entire fall in that. And the final step was playing at Lamson Park the last two weekends in front of UL’s fans. She had played in front of big crowds at Oklahoma, where she hit .326 with eight doubles, a homer and 18 RBIs as a freshman last season. But Lamson Park was different. “Completely different,” she said. “Fans didn’t cook for us. Fans didn’t make little goodie bags for us — cookies with chocolate-covered strawberries and put our numbers on the bag. That’s never been a thing at Oklahoma. So Dalton’s mind was made up. UL is indeed the place for her. She’s also not convinced it’s going to take very long for the Cajuns to be making a run at Oklahoma City again. UL vs. Southeastern, 4 p.m.
UL vs North Florida, 5 p.m.
UL vs. North Florida, 2 p.m.
UL vs. UMBC, 7 p.m.
UL vs. Memphis, 11:30 a.m.